The events of September 11, 2001 changed the way the world viewed terrorism. Canada played a leading role in the international community's efforts to assist Afghanistan to counter the terrorist threat, to promote global peace and security, and to ensure terrorism does not threaten Canadian interests. But even before that, Canada witnessed the devastating tragedy of the Air India bombing that killed 329 people, most of them Canadians. Canada's capacity to counter terrorist threats on all fronts has increased significantly. The threat persists, however, and recent events in Norway remind us that threats can come from different directions, and that we cannot afford complacency in the face of a complex and evolving threat. I am pleased to present this Strategy, Building Resilience Against Terrorism, which sets out Canada's approach to tackling this global and domestic threat. The Strategy reflects the ongoing and multifaceted activities of government departments and agencies that are involved in counter-terrorism. For the first time it sets out, in a coherent and unified format, how these activities contribute to the Government's Strategy for countering terrorism. The Strategy enshrines the Government of Canada's existing approach to countering terrorism. In conjunction with commitments made in the December 2010 Government of Canada Response to the Commission of Inquiry into the Investigation of the Bombing of Air India Flight 182, it will help to organize and prioritize counter-terrorism initiatives and investments and ensure that Government activities address the risks we face. Ensuring the safety and security of its citizens is a key priority for this Government. This objective cannot be met by the federal government alone. Partnership is key to ensuring this security. Only through working with our international allies, and through effective cooperation with all levels of government and civil society, can we achieve these goals. I firmly believe that it is therefore in our shared interest to understand the terrorist threat—and to understand the Strategy for confronting it. Building Resilience Against Terrorism is an important contribution to this partnership between citizens and Government. The first priority of the Government of Canada is to protect Canada and the safety and security of Canadians at home and abroad. 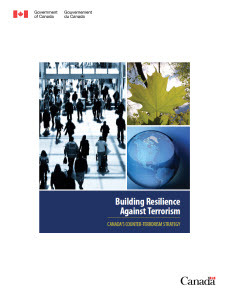 Building Resilience Against Terrorism, Canada's first Counter-terrorism Strategy, assesses the nature and scale of the threat, and sets out basic principles and elements that underpin the Government's counter-terrorism activities. Together, these principles and elements serve as a means of prioritizing and evaluating the Government's efforts against terrorism. The overarching goal of the Strategy is: to counter domestic and international terrorism in order to protect Canada, Canadians and Canadian interests. Violent Islamist extremism is the leading threat to Canada's national security. Several Islamist extremist groups have identified Canada as a legitimate target or have directly threatened our interests. In addition, violent “homegrown” Sunni Islamist extremists are posing a threat of violence. As the 1985 Air India bombing demonstrates, terrorist threats to Canada can also come from other sources. Other international terrorist groups like Hizballah or the remnants of the Liberation Tigers of Tamil Eelam continue to pose a threat, whether it is a direct attack against Canada and its allies, or the use of our territory to support terrorism globally. At home, issue-based domestic extremists may move beyond lawful protest to threaten acts of terrorism. Canadian interests around the world will continue to remain at risk of being targeted by terrorist attacks for the foreseeable future. Building resilience is the Strategy's core principle. The ultimate goal is a Canada where individuals and communities are able to withstand violent extremist ideologies, and where society is resilient to a terrorist attack, if one occurs. Counter-terrorism activities are also guided by the principles of respect for human rights and the rule of law, the treatment of terrorism as a crime, proportionality and adaptability. Working through partnerships is central to the success of the Strategy. It would include collaboration with Canada's international partners, security intelligence and federal, provincial and municipal law enforcement agencies, all levels of government and civil society. In particular, the relationship between security intelligence and law enforcement communities has strengthened over time. This seamless cooperation continues to be critical to addressing the terrorist threat. 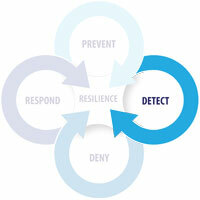 The Strategy operates through four mutually reinforcing elements: Prevent, Detect, Deny and Respond. All Government activity is directed towards one or more of these elements. Activities in this area focus on the motivations of individuals who engage in, or have the potential to engage in, terrorist activity at home and abroad. The emphasis will be on addressing the factors that may motivate individuals to engage in terrorist activities. This element focuses on identifying terrorists, terrorist organizations and their supporters, their capabilities and the nature of their plans. This is done through investigation, intelligence operations and analysis, which can also lead to criminal prosecutions. Strong intelligence capabilities and a solid understanding of the changing threat environment is key. This involves extensive collaboration and information sharing with domestic and international partners. Intelligence and law enforcement actions can deny terrorists the means and opportunities to pursue terrorist activities. This involves mitigating vulnerabilities and aggressively intervening in terrorist planning, including prosecuting individuals involved in terrorist related criminal activities, and making Canada and Canadian interests a more difficult target for would-be terrorists. Terrorist attacks can and do occur. Developing Canada's capacities to respond proportionately, rapidly and in an organized manner to terrorist activities and to mitigate their effects is another aspect of the Strategy. This element also speaks to the importance of ensuring a rapid return to ordinary life and reducing the impact and severity of terrorist activity. The Strategy will serve to guide the Government's efforts in countering terrorism. Built into the Strategy are mechanisms for monitoring the Government's efforts and for reporting to Canadians on the Strategy's progress, including an annual report to Canadians on the evolving threat environment. Canada is not immune from terrorism. A number of international and domestic extremist groups are present in Canada—some engage in terrorist activity here, or support terrorism beyond Canada's borders. Some have worked to manipulate or coerce members of Canadian society into advancing extremist causes hostile to Canada's peace, order and good government. Terrorism is a serious and persistent threat to the security of Canada and its citizens. Canadians expect their government to respond to threats in a manner that preserves their freedom and security. For the first time, Building Resilience Against Terrorism clearly sets out Canada's integrated approach to dealing with terrorist threats, both at home and abroad. It explains how Canada's local, national and international efforts support each other to protect Canadians and Canadian interests. through periodic review, assists in regularly taking stock of the nature of the terrorist threat and how Canada is dealing with it. Reflected throughout the Strategy is the fundamental belief that countering terrorism requires partnerships. Achieving the Government's counter-terrorism goals will require an integrated approach not only by the Government of Canada, but by all levels of government, law enforcement agencies, the private sector and citizens, in collaboration with international partners and key allies, such as the United States (U.S.). Partnership with citizens is important. Citizens need to be informed of the threat in an honest, straightforward manner to foster a deeper understanding of why particular actions are needed in response to the threat. Citizens also have a responsibility to act—a responsibility to work with Government and security personnel, and a responsibility to build strong and supportive local communities. Only when these tasks are shared will a truly resilient Canada be achieved. The terrorist threat has evolved over the years, and Canada now faces ever more decentralized and diverse threats. That means Canada's Strategy must be adaptable and forward-looking—not just to react to emerging threats but to identify and understand emerging trends. To succeed, the Government's counter-terrorism efforts cannot be limited to operations directed at groups or individuals already involved in terrorist activities. They must also be reinforced by preventive measures, aimed at keeping vulnerable individuals from being drawn into terrorism. These measures call for a focus on individual motivations, and other factors contributing to recruitment into terrorist activities. It will never be possible to stop all terrorist attacks. Nevertheless, Canadians can expect that their Government will take every reasonable step to prevent individuals from turning to terrorism, to detect terrorists and their activities, to deny terrorists the means and opportunities to attack and, when attacks do occur, to respond expertly, rapidly and proportionately. Terrorism is not a new tactic. In the past few decades, several hundred Canadian civilians have been killed or injured in terrorist incidents. The current iteration of al Qaida inspired terrorism is only one example of the terrorist threats facing Canada. Other nationalist, politico-religious, or multi-issue groups continue to employ terrorist tactics in support of their aims. As a result, terrorism can be seen as a tactic whose use is connected to the drivers of political violence that exist at a given time, and the existence of individuals and groups who are willing to use violence to achieve specific goals. In Canada, the definition of terrorist activity includes an act or omission undertaken, inside or outside Canada, for a political, religious or ideological purpose that is intended to intimidate the public with respect to its security, including its economic security, or to compel a person, government or organization (whether inside or outside Canada) from doing or refraining from doing any act, and that intentionally causes one of a number of specified forms of serious harm. Terrorism continues to pose a significant threat to Canada, Canadians and Canadian interests abroad. The global terrorist threat—from groups and individuals—is becoming more diverse and more complex. The threat to Canada from terrorism has three main components: violent Sunni Islamist extremism—both at home and abroad, other international terrorist groups, and domestic, issue-based extremism. Recurring instances of violence linked to Sunni Islamist extremism have punctuated the development of the terrorist threat since at least the 1970s. Today, violence driven by Sunni Islamist extremism is the leading threat to Canada's national security. Despite having been under intense pressure for the past decade, foreign-based Sunni Islamist extremism has proven to be both adaptable and resilient. Several extremist groups have explicitly identified Canada as a legitimate target for attacks or have taken actions that threaten Canada's international interests. Al Qaida, led by Ayman al Zawahiri since the death of Usama bin Laden in May 2011, remains at the forefront of Sunni Islamist extremism and continues to serve as an ideology and inspiration for potential terrorists worldwide. Although al Qaida capacities have been constrained in recent years by global counter-terrorism efforts, other Sunni Islamist groups affiliated with al Qaida—either through formal allegiances or by looking to al Qaida as an example—have evolved and pose a substantial threat to Canada and the international community. The single narrative that Islam is under attack by the West survives, nothwithstanding the death of Usama bin Laden, and is shared widely by al Qaida affiliated groups. Two of these groups in particular, al Qaida in the Arabian Peninsula and al Shabaab, illustrate the diffusion of the Sunni Islamist terrorist threat. These groups and others like them may share some common cause with al Qaida, but largely remain operationally independent. The Yemen-based al Qaida in the Arabian Peninsula have pursued efforts to destabilize the Arabian Peninsula, but they have also pursued international attacks that may have affected Canada, such as their failed December 2009 bombing of Northwest Airlines Flight 253 in Canadian airspace. Al Shabaab is predominantly a threat in Somalia, but they have conducted attacks elsewhere in East Africa. Several Canadians are believed to have left Canada to join the group. These examples highlight that efforts to counter the terrorist threat to Canada must consider both al Qaida itself and the threat posed by several other different groups within the spectrum of Sunni Islamist extremism. While al Qaida affiliates may pose a threat of terrorist attacks from abroad, violent “homegrown” Sunni Islamist extremists are posing a threat of violence within Canada. Homegrown extremists are those individuals who have become radicalized by extremist ideology and who support the use of violence against their countries of residence, and sometimes birth, in order to further their goals. A number of individual extremists from Western countries have attempted terrorist attacks, inspired by, but not directly connected to, Sunni Islamist extremists abroad. In 2006, 18 individuals were arrested in Ontario for participating in a terrorist group whose intent was to bomb a number of symbolic Canadian institutions. Of these individuals, 11 were later convicted. Another Canadian, Mohammed Momin Khawaja, was found guilty in 2008 as a result of his involvement in a failed terrorist plot in the United Kingdom. Canadians and other individuals suspected of a variety of activities related to Islamist extremism remain active across the country. Some of these individuals are spreading violent propaganda, raising money to support terrorism, helping individuals travel to foreign conflict zones, and establishing connections with likeminded extremists in Canada and abroad. Only a small number of individuals may have the intent to engage in terrorism, but homegrown extremists will pose a terrorist threat within Canada for the foreseeable future. Like Canada, many countries have identified the challenges posed by homegrown extremism. In particular, the increased availability of Internet propaganda and sophisticated networking tools connect Sunni Islamist extremists with supporters around the world. Extremist leaders have sought to encourage homegrown extremism by using English-language material, reaching out to vulnerable individuals in Western countries and encouraging “do-it-yourself” terrorism. Radicalized Canadians have also travelled to global hot spots like Pakistan, Somalia and Yemen, training or fighting with Sunni Islamist extremist groups. These individuals could participate in terrorism abroad, return to Canada and push others to violence, or return to Canada to carry out terrorist activities on Canadian soil. International terrorism is not a new phenomenon in Canada. The threat posed by violent Sunni Islamist extremists may be Canada's most pressing concern, but Canada faces a broad range of international terrorist threats. It is worth recalling the tragic bombing of Air India Flight 182 in 1985—the worst terrorist attack in Canadian history—was conducted by Sikh extremists and claimed 329 lives, 280 of them Canadian. Since some international terrorists are completely focused on conducting violence abroad, Canadian concerns are not solely limited to preventing attacks in Canada, but include the prevention of violent global extremism. Threats are also posed by Canadians who support violent conflicts abroad, or by foreigners in Canada interested in using this country for refuge, financing, recruitment or other forms of support. These threats can be further complicated when foreign states sponsor certain terrorist groups as a means of furthering their own violent objectives. Canadian interests are threatened be it a direct attack against Canada or its allies, or the use of Canada to support terrorism elsewhere in the world. For these reasons, Canada must actively monitor the full spectrum of terrorist threats. Canada has listed under the Criminal Code more than 40 terrorist entities that are considered a threat, having either knowingly engaged in or facilitated international terrorism. These entities include the Liberation Tigers of Tamil Eelam LTTE?, the Euskadi ta Askatasuna (ETA), the Fuerzas Armadas Revolucionarias de Colombia (FARC), Lashkar-e-Tayyiba (LeT), Hamas and Hizballah. Some international terrorist groups have more explicit Canadian connections than others. Although the civil war in Sri Lanka has ended, it is important that any surviving elements of the LTTE are not allowed to rebuild in Canada in order to engage in terrorist activities. In May 2010, for example, Prapaharan Thambithurai, an LTTE fundraiser, was convicted of terrorist financing in Canada. Ongoing struggles in the Middle East present another example where foreign conflicts pose a threat of international terrorism. Lebanon-based Hizballah, a listed terrorist entity under the Criminal Code, has been implicated in international terrorist attacks and soliciting support from expatriate Lebanese communities around the world. Other groups pose a threat to international and Canadian efforts to support the Middle East peace process. Hamas, for example, uses political and violent means to pursue the establishment of an Islamic Palestinian state in Israel. Hamas has been responsible for several hundred terrorist attacks and continues to present an obstacle to regional peace, despite its position as the elected government of the Gaza Strip. Although not of the same scope and scale faced by other countries, low-level violence by domestic issue-based groups remains a reality in Canada. Such extremism tends to be based on grievances—real or perceived—revolving around the promotion of various causes such as animal rights, white supremacy, environmentalism and anti-capitalism. Other historical sources of Canadian domestic extremism pose less of a threat. Although very small in number, some groups in Canada have moved beyond lawful protest to encourage, threaten and support acts of violence. As seen in Oklahoma City in 1995 and in Norway in 2011, continued vigilance is essential since it remains possible that certain groups—or even a lone individual—could choose to adopt a more violent, terrorist strategy to achieve their desired results. The nature of the terrorist threat facing Canada continues to diversify and become more widespread. As societies change and evolve—sometimes violently—the terrorist threat is often connected to events that are not always within Canada's control. It remains to be seen, for instance, how events occurring across the Middle East and North Africa affect the terrorist threat. Strategic drivers, such as globalization, rapid technological change, an increasingly networked society and fragile states, create new and different vulnerabilities that terrorists may seek to exploit. As such, governments must keep pace with a changing cyber environment, the proliferation of more sophisticated weaponry—including weapons of mass destruction, emerging telecommunication trends, and the accelerated flow of people, resources and ideas around the world. Within Canada, terrorists may also continue exploring means to acquire financial and logistical support using both legal and illegal enterprises. A risk also remains that terrorists and their supporters will seek to take advantage of Canada's open, democratic society, its generous legal and social networks, or exploit its advanced financial and technology sectors to redirect resources in support of their causes. Canada's success in remaining resilient to the terrorist threat will depend on the adoption of a flexible and forward-looking approach that effectively adapts to the changing threat environment. The first priority of the Government of Canada is to protect Canada and the safety of Canadians at home and abroad. That means protecting the physical security of Canadians, and their values and institutions. The Strategy is necessarily comprehensive because the terrorist threat is multidimensional. First, Canada has been and will continue to be a target of terrorists. Second, Canadian citizens and permanent residents are known to have been involved in terrorist activities or associated with international terrorist groups. Third, terrorists may try to use Canada as a base to finance, support or conduct attacks against other countries. The Strategy is directed against terrorism in all its dimensions. Countering terrorism demands a global strategy of partnership with others. The Strategy ensures that Canada remains a capable and reliable partner in countering international terrorism and in defending Canada, Canadians and Canadian interests. Principles matter. They affirm Canada's democratic values. They provide a clear articulation of how Canada conducts its work. They explain to others around the world what Canada stands for, and what they can expect from Canada in countering the terrorist threat. These principles are based on fundamental Canadian values, as well as Canada's practical experience in dealing with terrorism. The Canadian experience has been shaped by a deep attachment to democracy, the rule of law, respect for human rights and pluralism. It is based on openness to ideas and innovations, and to people from every part of the world. It is also a society that rejects intolerance and violent extremism. Security ultimately depends upon a respect for these values. When they are imperilled, the safety and prosperity of everyone will be threatened. A proportionate and measured approach—one that has support and participation from all partners—is more likely to lead to long-term success in Canada's overall counter-terrorism efforts, as well as in its efforts to build a resilient society. Resilience is both a principle and an underlying theme of the Strategy. Building a resilient Canada involves fostering a society in which individuals and communities are able to withstand violent extremist ideologies and challenge those who espouse them. They support and participate in efforts that seek to protect Canada and Canadian interests from terrorist threats. A resilient Canada is one that is able to mitigate the impacts of a terrorist attack, ensuring a rapid return to ordinary life. Terrorist activities are criminal acts. The Government will always aim to support the prosecution of those responsible for terrorist activities in Canada and abroad whenever possible, taking into account any competing national security interests that may compromise the safety and security of Canadians. Criminal investigations into terrorist activity will continue to be led by the police, supported by the Canadian Security Intelligence Service (CSIS) and other agencies with security intelligence roles. Canada will work with foreign partners to build their legal capacity to investigate and prosecute terrorist activities and assist them in foreign prosecutions. Support for the prosecution of terrorists demonstrates the Government's commitment to protecting the public and to countering terrorism. Canadian society is built on the rule of law as a cornerstone of peace, order and good government. It follows that all counter-terrorism activities must adhere to the rule of law. Government institutions must act within legal mandates. Authorities for counter-terrorism efforts are defined by laws consistent with Canada's Constitution, and that include mechanisms for accountability, oversight and review that protect Canadian society from the inadvertent erosion of the very liberties that Canada is determined to uphold. Accountability develops trust, which builds security. This principle includes respect for human rights, both those enshrined in the Canadian Charter of Rights and Freedoms (the Charter) and in international legal obligations, such as international human rights and humanitarian law. Respecting and promoting human rights is fundamental to core Canadian values. Security is also a human right. Terrorism is an attack against those very rights that are fundamental to Canadian society, such as freedom of thought, expression and association, and the right to life, liberty and security of the person. The belief in human rights is fundamental. It governs policy choices and decision making, and it governs standards in investigations. It also guides Canada's dealings with countries with questionable human rights records. Canadian officials will often be called upon to exercise careful judgment on these matters, but understanding the place of human rights at the core of Canada's strategic approach provides guidance when making these decisions. The Strategy is based on the knowledge that the terrorist threat can most effectively be countered through the extensive use of cooperation and partnerships. This includes partnerships between federal departments and agencies as well as with provincial, territorial and municipal governments. Partnerships with provincial and municipal law enforcement agencies are particularly crucial. It also means engaging with industry stakeholders, non-governmental organizations (NGOs), citizens and foreign governments. Domestically, counter-terrorism involves many federal departments and agencies (see Annex A for a full listing). Cooperation and seamless information sharing within and between security intelligence agencies and law enforcement is essential to effectively address the terrorist threat. These institutions in turn work with their provincial, territorial and municipal counterparts. One notable mechanism for doing so is through the Canadian Association of Chiefs of Police Counter-terrorism and National Security Committee. Current membership includes senior officials from the Royal Canadian Mounted Police (RCMP), from the provincial and municipal police forces across Canada and from CSIS, as well as the Correctional Service of Canada (CSC) and the Canadian Forces Provost Marshal. Governments partner extensively with the private sector and NGOs to protect the nation's critical infrastructure and bolster the resilience of communities. Everyone is called upon to play a part. Government partnership with citizens is critical. Citizens need to be informed of the threat in an honest, straightforward manner to foster a deeper understanding of why particular actions are needed to respond to the threat. Working in local communities, citizens will also provide the most effective avenue to strengthen society so as to maximize resistance to violent extremism. Citizens have a responsibility to work with law enforcement and security personnel. In this way, Government stands shoulder to shoulder with citizens in standing up to violent extremist ideology. Terrorism is a global threat. Events in other countries are inextricably linked to extremism in Canada. The global environment is more interdependent than ever before, and what happens abroad can have a significant impact domestically. The dividing lines between security policy and foreign and defence policy have blurred significantly. Countering the threat demands close cooperation with other countries. This means continuing collaboration with longstanding allies and well established international organizations, such as the North Atlantic Treaty Organization (NATO). It also means working with partners with which Canada has less history of dealing. Sometimes these efforts will be bilateral. At other times they will require working through multilateral fora, such as the United Nations (UN), the G8 and the Global Counter-terrorism Forum. It may mean working to stabilize countries that provide a permissive threat environment. Foreign policy planning is more relevant to Canada's national security than ever before. 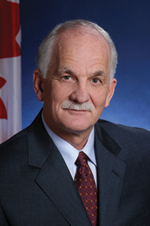 Canada is also an active participant in the work of the Financial Action Task Force (FATF), the international organization that sets standards with respect to combating money laundering and terrorist financing, and the Egmont Group, a forum for financial intelligence units around the world to facilitate and improve cooperation, especially in the area of information exchange, in the fight against money laundering and terrorist financing. A proportionate and measured response to terrorism is the best way to act consistently with Canadian values and to preserve community support for counter-terrorism efforts. Canada's approach to terrorism will be proportionate to the threat, neither an overreaction nor an underreaction. As security is a fundamental human right, the Government of Canada will uphold this right in a manner consistent with other Canadian rights and freedoms. Accordingly, the measures taken must be carefully designed to reasonably manage the actual threat while minimizing interference with the public as people go about daily activities. Canada's response to terrorism must anticipate how the threat will evolve over time. Equally, Canada's efforts will focus on prevention and address factors that make individuals susceptible to violent extremist ideologies. Terrorist groups adapt their techniques and capabilities to their operating environment. They use new technologies, respond to international and domestic events, and create new organizational structures and capabilities in response to domestic and international counter-terrorism efforts. Canada's approach to counter-terrorism will be flexible and forward-looking to anticipate and adapt to these changes by adjusting counter-terrorism activities and priorities. To maximize results under the Strategy, it must also address the factors that contribute to terrorism. For this reason, the Strategy seeks to address conditions that are conducive to terrorism through efforts, such as countering violent extremism and Canada's Counter-terrorism Capacity Building Program. This chapter describes how the Government is seeking to achieve the aim of: countering domestic and international terrorism in order to protect Canada, Canadians and Canadian interests. respond proportionately, rapidly and in an organized manner to terrorist activities and mitigate their effects. The Strategy is represented in Figure 1. All four elements contribute to building a resilient Canada. The Prevent element fosters a Canada that is resistant to violent extremism. The Detect and Deny elements ensure Canada is able to identify terrorist activities early, and that it is a difficult target for would-be terrorists. 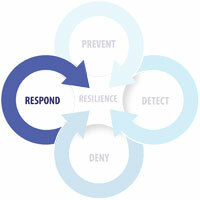 The Respond element engenders a resilient society able to bounce back quickly when terrorist incidents do occur. the main programs and activities that contribute to that element. For an issue as complex and cross cutting as counter-terrorism, many programs and activities contribute to the attainment of more than one strategic outcome, and in some cases, support more than one element of the Strategy. The programs and activities identified here are discussed in relation to the element of the Strategy to which they make their primary contribution. 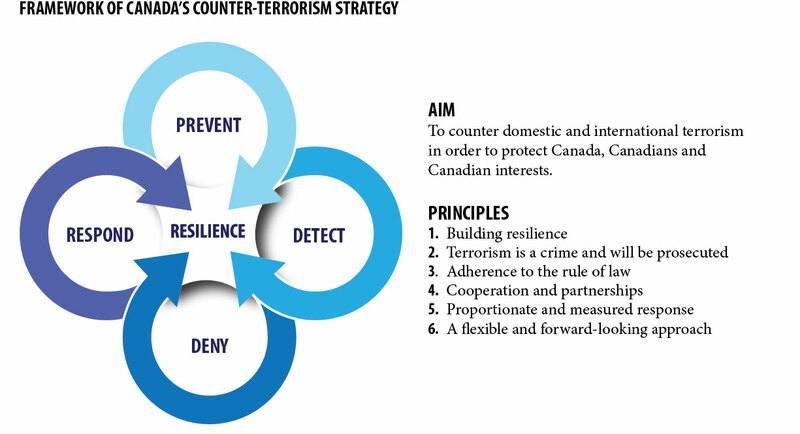 This figure is an illustration of the aim, principles and framework of Building Resilience Against Terrorism: Canada's Counter-terrorism Strategy. The aim of the Strategy is to: counter domestic and international terrorism in order to protect Canada, Canadians and Canadian interests. 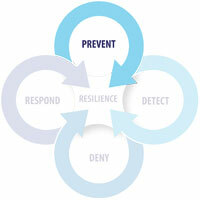 Resilience is illustrated as a ring surrounding the sphere to demonstrate that all four elements contribute to building a Canada resilient to terrorism. Purpose: to prevent individuals from engaging in terrorism. This element focuses on the motivations of individuals who engage in, or have the potential to engage in, terrorist activities at home and abroad. Canada aims to target and diminish the factors contributing to terrorism by actively engaging with individuals, communities and international partners, and through research to better understand these factors and how to counter them. Resilience of communities to violent extremism and radicalization is bolstered. Violent extremist ideology is effectively challenged by producing effective narratives to counter it. The risk of individuals succumbing to violent extremism and radicalization is reduced. The threat from violent extremism is a significant national security challenge. Radicalization, which is the precursor to violent extremism, is a process by which individuals are introduced to an overtly ideological message and belief system that encourages movement from moderate, mainstream beliefs towards extremist views. This becomes a threat to national security when individuals or groups espouse or engage in violence as a means of promoting political, ideological or religious objectives. The Strategy articulates Canada's commitment to addressing the factors contributing to terrorism, including radicalization leading to violence. The threat of violent extremism does not originate from a single source, but a diverse range of groups and individuals who either actively participate in or who support violent extremist activities. For this reason, the Prevent element of the Strategy focuses primarily on building partnerships with groups and individuals in Canadian communities. Working closely with local-level partners will help foster a better understanding of preventative and intervention methods to stop the process of radicalization leading to violence. the RCMP's National Security Community Outreach, which responds directly to the threat of radicalization leading to violent extremism through local initiatives intended to address potential political violence and to identify and address the concerns of minority communities. To effectively counter violent extremism, a culture of openness must exist between citizens and government. This will require the Government to share knowledge with Canadians about the nature of the terrorist threat in order to foster a deeper understanding of the need for particular actions. The role of law enforcement and CSIS is pivotal. They can offer knowledge and analysis of the threat, which can assist governments and communities to develop more effective responses. In this way, the Prevent element requires law enforcement and CSIS to develop strong capabilities in community engagement, including the enhanced language and cultural awareness skills needed to engage with diverse Canadian communities. Other Government departments, such as Public Safety Canada, Citizenship and Immigration Canada (CIC), CSC and the Department of Foreign Affairs and International Trade (DFAIT) also have supporting programs that directly or indirectly help mitigate the threat of violent extremism in Canada and abroad. Some terrorist organizations have developed sophisticated propaganda and outreach strategies. Terrorist groups communicate with people who are potentially susceptible to violent extremist ideology through various media, especially the Internet, which has evolved as a significant forum for violent extremist communication and coordination. The Prevent element would focus on providing positive alternative narratives that emphasize the open, diverse and inclusive nature of Canadian society and seek to foster a greater sense of Canadian identity and belonging for all. Programs would be aimed at raising the public's awareness of the threat and at empowering individuals and communities to develop and deliver messages and viewpoints that resonate more strongly than terrorist propaganda. Under the Prevent element, Canada will continue to coordinate its efforts with like-minded countries to stabilize fragile states and limit the conditions conducive to the development of violent extremism globally. This will include the work of DFAIT, the RCMP, CSIS, the Department of National Defence and the Canadian Forces (DND/CF) and the Canadian International Development Agency. Under the United Nations Global Counter-Terrorism Strategy (2006), member states are to address the conditions conducive to the spread of terrorism by strengthening existing programs on conflict prevention, negotiation, mediation, conciliation, peacekeeping and peace building. They also emphasize initiatives that promote inter-religious and inter-cultural tolerance, reduce marginalization and promote social inclusion. DFAIT has developed projects to work with communities to counter violent extremism in regions of concern, and to promote democratic values. Purpose: to detect the activities of individuals and organizations who may pose a terrorist threat. To counter the terrorist threat, knowledge is required on the terrorists themselves, their capabilities and the nature of their plans. It is also necessary to identify who supports their activities. Canada does this through investigation, intelligence operations and analysis, which can also lead to criminal prosecutions. Detection requires strong intelligence capacity and capabilities, as well as a solid understanding of the strategic drivers of the threat environment, and extensive collaboration and information sharing with domestic and international partners. Terrorist threats are identified in a timely fashion. Robust and comprehensive detection of terrorist activity and effective alerting systems are in place. Information is shared effectively, appropriately and proactively within Canada, with key allies and non-traditional partners. For effective detection, Canada must have strong capabilities for the collection, analysis and dissemination of usable intelligence. The primary Government of Canada collection organizations are CSIS, the Communications Security Establishment Canada (CSEC) and the RCMP. CSIS and the RCMP use a full range of collection methods. CSEC acquires and provides foreign signals intelligence (SIGINT) in accordance with the Government's intelligence priorities and provides technical and operational support to law enforcement and security intelligence agencies. Other federal organizations, such as DND/CF, DFAIT, the Canada Border Services Agency (CBSA), Transport Canada and the Financial Transactions and Reports Analysis Centre (FINTRAC), and the Charities Directorate of the Canada Revenue Agency (CRA) also collect information in support of their primary responsibilities, which is important in establishing a broader counter-terrorism intelligence picture. For these organizations the exchange of information with domestic and international partners is crucial. The Department of Finance is currently developing options to enhance the exchange of intelligence between FINTRAC and its federal partners. FINTRAC contributes to the prevention and deterrence of terrorist financing by ensuring compliance with the Proceeds of Crime (Money Laundering) and Terrorist Financing Act (PCMLTFA). Millions of financial transaction reports are sent to FINTRAC each year by banks, credit unions and other financial intermediaries, resulting in financial intelligence that assists in the investigation and prosecution of money laundering, terrorist activity financing and other threats to the security of Canada. These measures strengthen Canada's financial system by deterring individuals from using it to carry out terrorist financing or other criminal activity. To further strengthen Canada's anti-terrorist financing regime, an Illicit Financing Advisory Committee comprised of several federal partners has been developed to identify illicit financing threats from abroad and to develop targeted measures to safeguard Canada's financial and national security interests. In order to detect and address risks to the charitable sector, the Charities Directorate of the CRA reviews applications and conducts audits, as well as collects and analyzes multisource intelligence. It also exchanges information with Canadian intelligence and law enforcement partners in compliance with the Income Tax Act, the Charities Registration (Security Information) Act, and the PCMLTFA. operates a Counter-terrorism Information Officer initiative that provides first responders with terrorism awareness training on key indicators of terrorist activities, techniques and practices in order to help detect threats at the earliest stage possible. Collection also occurs at the border. Through its Immigration Security Screening program, CBSA, in collaboration with CSIS, can detect the movement of potential subjects of interest as they apply for temporary or permanent residence, or refugee status. Information provided by CSIS facilitates CIC and CBSA in their efforts to assess the admissibility of these individuals under the Immigration and Refugee Protection Act (IRPA). CBSA also plays a role in the monitoring of cross-border currency flows, and can seize unreported currency flows suspected of being the proceeds of crime or related to terrorist financing. Collection activities also occur outside Canada. For example, CSEC produces and disseminates foreign SIGINT to support government decision making in several areas, such as national security. CSIS conducts security intelligence collection and operations abroad in support of its mandate, and maintains strong relationships with foreign agencies with which it regularly exchanges information on potential threats to the security of Canada. DND/CF can provide strategic reconnaissance to collect or verify information in support of other government departments. Through the broad range of contacts in its overseas network, DFAIT assesses social, economic, security and political developments that help define a global threat environment. The RCMP carries out extraterritorial investigations of terrorist activity when committed against a Canadian citizen or by a Canadian citizen abroad. Achieving the desired results under Detect requires cooperation between security intelligence agencies, and federal, provincial, territorial and municipal law enforcement. It also involves international cooperation with close allies. This includes Canada's traditional allies, such as NATO, INTERPOL and EUROPOL, but will also involve increasing interaction with non-traditional partners Canada has less history in dealing with. Once information is collected, it must be analyzed to produce intelligence. Government departments and the security intelligence agencies have their own analysis and assessment units reflecting their particular responsibilities. The key organizations within the assessment community are discussed below. Other organizations provide assessments reflecting their particular responsibilities. The Privy Council Office International Assessment Staff (PCO IAS) plays a leading role in coordinating the efforts of the Canadian assessment community and provides PCO and other senior government clients with policy-neutral assessments of foreign developments and trends that may affect Canadian interests. DFAIT provides assessments supporting government departments concerned with international affairs as well as support to diplomatic missions, while DND/CF provide assessments on issues of concern to the defence community. CSIS combines the information they collect themselves with information from other sources to provide intelligence assessments on terrorist threats. FINTRAC provides strategic financial intelligence and tactical disclosures to the security and intelligence community. Financial intelligence includes analysis of trends, patterns and typologies, and provides a detailed picture of suspicious monetary movements, establishing complex links between individuals, businesses and accounts, in support of law enforcement investigations and prosecutions of terrorism related offences. The RCMP also prepares tactical and strategic assessments in support of RCMP operations and planning, and contributes to overall Government of Canada assessment efforts through participation in PCO IAS and the Integrated Terrorism Assessment Centre (ITAC). ITAC provides comprehensive and timely assessments of the terrorist threat to Canadian interests at home and abroad that integrate intelligence from across departments and agencies and from external partners. ITAC is a government resource staffed by federal representatives from a wide range of federal government institutions. Wide department and agency representation provides ITAC with strong institutional expertise, as well as access to the information holdings of their home organizations. DFAIT's Operations Centre monitors world events, alerts senior governmental officials to items of national interest and supports interdepartmental task force groups. It may also become the focal point for communication with affected missions and other government departments and agencies in incidents abroad. Internationally, Canada has well-established practices for sharing counter-terrorism information with allies, multilateral agencies like NATO and other key partners. Over time, Canada will strengthen relationships with current partners while seeking and developing new partnerships. The Strategy will serve to reinforce security initiatives between Canada and the U.S. and will complement the Canada-U.S. Beyond the Border: A Shared Vision for Perimeter Security and Competitiveness. In order to effectively detect the terrorist or terrorist financing threat, federal government departments and agencies must share information efficiently amongst themselves; with the provinces, territories and municipalities; with Canada's allies and with non-traditional international partners; as well as with private sector stakeholders. Public Safety Canada and the Department of Justice continue to lead the development of legislative proposals to improve information sharing among departments and agencies for national security purposes that are consistent with the Charter and the Privacy Act. The Government must leverage new technologies to ensure that information required for national security purposes is available to decision makers in a timely manner. The Government is working to upgrade this infrastructure, which provides the tools required by front line personnel and others to share classified information. Purpose: to deny terrorists the means and opportunity to carry out their activities in order to protect Canadians and Canadian interests. Intelligence and law enforcement actions, prosecutions, and domestic and international cooperation are important to mitigate vulnerabilities and aggressively intervene in terrorist planning. The end goal is to make Canada and Canadian interests a more difficult target for would-be terrorists. A strong ability to counter terrorist activities at home and abroad is maintained. Prosecutions are pursued and concluded effectively. The means and opportunity to support terrorist activities are denied. Strong cooperation with key allies and non-traditional partners is maintained. 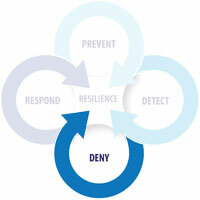 The Deny element of the Strategy employs a layered approach to security. It begins with programs and activities abroad aimed at denying terrorists the means and opportunities to carry out their attacks abroad and in Canada. It also includes activities at and within Canada's borders to deny terrorists the means and opportunities to act in Canada. to investigate and prosecute individuals involved in terrorist related criminal activities. Terrorism does not respect national borders. Domestic efforts to deny terrorists the means and opportunity to prepare for, and carry out, their activities must be matched by similar efforts around the world. Otherwise, terrorists will simply move their operations to a safe haven. Safe havens facilitate capacity building and attack planning. For this reason, the Deny element involves a strong degree of international cooperation. DFAIT has the primary responsibility for coordinating Canada's international efforts on counter-terrorism. This includes, for example, leading bilateral security consultations on counter-terrorism issues with a range of security partners. Canada is a signatory to thirteen UN sponsored terrorism related international conventions that address threats like hostage taking, hijacking, terrorist bombings and terrorist financing, and has implemented UN Security Council Resolutions relevant to combating the financing of terrorism. Canada is involved in the development of specific legal instruments, best practices and international standards to combat terrorism, including terrorist financing, in fora that include the UN, the G7, the G8, the Asia-Pacific Economic Cooperation, the Organization of American States, the Association of Southeast Asian Nations Regional Forum, NATO, the Organization for Security Cooperation in Europe, the International Civil Aviation Organization, the International Maritime Organization, the World Customs Organization, the FATF, and the Egmont Group. Canada also partners with the international community to promote security in other states, including fragile states, under its whole-of-government approach, which involves defence, development and diplomacy. Counter-terrorism capacity building assists other states with training, funding, equipment, technical and legal assistance to deny terrorists the means and opportunity to carry out attacks at home, and to deny them the ability to attack targets elsewhere. Through DFAIT projects and with the Asia/Pacific Group on Money Laundering, the Charities Directorate of the CRA has contributed to capacity building initiatives in other jurisdictions to support the combatting of terrorist financing through charities. This element also aims to deny terrorists access to weapons, including the CBRNE materials needed to build weapons of mass destruction. Continual adaptation of domestic policy to maintain compliance with international non-proliferation measures, such as the Treaty on the Non-Proliferation of Nuclear Weapons, is necessary. This means having adequate security measures at facilities where such material is stored. It includes such activities as the role of the Public Health Agency of Canada (PHAC) in regulating the importation and use of human pathogens and toxins to prevent their importation and use as biological agents by terrorists. The CBSA also plays a role in managing the movement of exports by seizing goods that are non-compliant with export laws and regulations and destined for countries that pose a threat to Canada and its allies, and by working with the RCMP to investigate and support the prosecution of individuals behind such movements. A key element of the CBSA's approach to combat irregular migration is its “multiple borders strategy” that strives to “push the border out” so that people posing a risk to Canada's security and prosperity are identified as far away from the actual border as possible—ideally before a person departs their country of origin. Admissibility screening occurs prior to the arrival of an individual in Canada, or immediately after arrival, to ensure that those who are inadmissible do not enter or cannot remain in Canada. As part of its enforcement mandate, CBSA officers carry out removal orders, with security and admissibility cases given top priority. Under Beyond the Border: A Shared Vision for Perimeter and Security and Competitiveness, Canada and the U.S. are working on a number of initiatives to deny terrorists the ability to use either country as a transit point to circumvent restrictions imposed by the other. The CBSA maintains 62 Liaison Officers in 46 locations abroad to interdict inadmissible individuals from boarding flights to Canada. The CBSA Liaison Officer network, through training, alerts and physical presence at international airports, supports transporters in the identification of improperly documented travelers. Additionally, Liaison Officers make recommendations to transporters not to carry passengers in possession of fraudulent documents or those who do not have the required travel documents to be admitted into Canada. Managing risk away from the border through partnerships with other border administrations and industry stakeholders is a key component of Canada's modern border management strategy. In an effort to enhance border and supply chain security to combat terrorism in the commercial stream, the CBSA has adopted several approaches including the harmonization of advanced electronic information and the enhancement of risk management systems. The CBSA also performs intelligence-based screening of commercial shipments destined for Canada. Lookouts help overseas, port of entry and inland CBSA and CIC officers identify and interdict individuals, businesses, commodities and conveyances that can harm Canada's national security. CSIS is an active partner in this effort. CIC has overall policy authority over entry into Canada. It is responsible for screening refugees, and admitting immigrants, foreign students, visitors and temporary workers to Canada, as well as managing the citizenship process. CIC also refuses entry to Canada to those deemed a threat to national security or public safety. Working with other federal departments and agencies, such as CSIS, RCMP and CBSA, CIC processes and screens applications, which include visa decisions, findings of inadmissibility, fraud detection, and the issuance of deportation orders. CIC is leading the Temporary Resident Biometrics Project in partnership with the CBSA and the RCMP which will introduce the use of biometric data, such as fingerprints and photographs, in the visa issuing process to accurately verify the identity and travel documents of foreign nationals who enter Canada. This will enhance the integrity of existing immigration programs by preventing criminals from entering Canada and facilitating the processing of legitimate applicants. Enforcement actions by law enforcement agencies deny terrorists the means and opportunity to carry out terrorist attacks. In achieving this, cooperation among federal, provincial and municipal law enforcement agencies is critical. For example, the RCMP-led INSETs in Ontario, Québec and British Columbia and, in all other provinces, the RCMP's National Security Enforcement Sections (NSES), are responsible for criminal investigations involving terrorist activity. Integrated Border Enforcement Teams, comprised of both Canadian and U.S. law enforcement border agencies, and marine security initiatives, protect Canada and the U.S. from potential terrorist threats at the border and impede the trafficking and smuggling of people and contraband. As a result of these prosecutions, PPSC has developed a body of specialized expertise in terrorism prosecutions. Cases are carefully assigned to qualified prosecutors and are monitored by a National Terrorism Prosecutions Coordinator, as well as regional coordinators. Other special measures ensure that resource demands are adequately managed. Prosecution policies and specialized resource tools relating to terrorism offences are continually being refined within PPSC. Terrorism-related cases can result in inordinately long and complex trials, typically referred to as “mega-trials.” To demonstrate the Government's commitment to improve the efficiency of terrorism prosecutions, legislation has been passed that will streamline “mega-trials.” To support these efforts, the PPSC is also committed to developing guidelines for the prosecution of terrorism offences that reflect best practices. Prosecuting terrorist activities may engage the relationship between intelligence and evidence, which can represent significant disclosure challenges. Individual rights, such as the right to due process, need to be balanced with the need to protect national security sources and methods. An extensive review of the disclosure process and the role of security intelligence agencies in this process is currently underway. The Government is also committed to supporting victims of terrorism through legislation that would allow them to sue perpetrators and supporters of terrorism, in Canadian courts. This would complement existing counter-terrorism measures by deterring terrorist acts and responding to the needs of victims of terrorism. Other judicial measures include, for example, the security certificate process under IRPA, which allows for the use of classified information in immigration proceedings before the Federal Court. The objective of this process is the removal from Canada of a non-citizen who is deemed inadmissible on security grounds. A powerful means of denying terrorists the ability to improve their capabilities is the process of listing individuals or organizations as terrorist entities. An entity can be listed under the Criminal Code or the United Nations al Qaida and Taliban Regulations (UNAQTR) and the Regulations Implementing the United Nations Resolutions on the Suppression of Terrorism (RIUNRST). Listing an entity is a very public means of labeling a group or individual as being associated with terrorism. Listing under the Criminal Code carries legal consequences such as making the entity's property subject to seizure, restraint or forfeiture and includes entities not necessarily covered by the first two mechanisms. Financial institutions are subject to reporting requirements with respect to the entity's property. It is also an offence to knowingly participate in, or contribute to, any activity of a terrorist group for the purpose of enhancing any terrorist group's ability to carry out a terrorist activity. The UNAQTR allows for the freezing of assets of terrorist entities belonging to, or associated with, the Taliban and al Qaida. The RIUNRST involves the application of Security Council measures and allows for individual Member States to determine the listed entities. It creates a Canadian list of terrorist entities broader in scope than the UNAQTR. Terrorism is fuelled by dollars and cents. Money provides terrorists with the weapons, training and support networks needed to facilitate their activities. The Charities Directorate of the CRA undertakes significant compliance measures, including denial and revocation of registered charity status, to deal with applicants and registered charities that do not comply with the Income Tax Act by directly or indirectly making their resources available to support terrorist entities. DFAIT manages the implementation of relevant UN Security Council resolutions, such as those that permit the freezing of assets. When entities (organizations and individuals) are designated under the Canadian regulations that implement UN resolutions or the Criminal Code, their assets are frozen and financial transactions with these entities are prohibited. In May 2010, Prapaharan Thambithurai, a Canadian citizen, was convicted of providing financial services to the LTTE, a listed terrorist entity, contrary to the Criminal Code. When an entity is listed in Canada under the UN regulations, the Office of the Superintendent of Financial Institutions immediately informs Canadian financial institutions to freeze any of its assets. The Department of Finance leads Canada's representation in the negotiation and implementation of international standards to combat terrorist financing through bodies such as the FATF, the G7 and G20, the International Monetary Fund and the World Bank. The Canadian business community and other levels of government own or operate a large proportion of Canada's critical infrastructure, which face threats from terrorists, criminals, hackers and other malicious actors. Critical infrastructure includes energy, transportation and oil and gas assets. Private companies and other levels of government are also targets for cyber terrorists, who seek to disrupt significant financial and business markets. The Government of Canada, in partnership with the provinces, territories and critical infrastructure sectors has developed a National Strategy and Action Plan for Critical Infrastructure, which will help enhance resilience of vital assets and systems against terrorist attacks. As part of this Strategy, the Government works closely with the owners and operators of critical infrastructure to identify risks and to understand what in practice can and should be done to reduce security vulnerabilities. Extensive networks exist for communication between the Government and sectors to protect critical infrastructure. Terrorist groups have expressed interest in developing the capabilities for computer based attacks against critical infrastructure. It can be difficult to determine the motives behind cyber attacks that perpetrate espionage or theft. The same modus operandi can be used by opportunistic criminals, corporate competitors, or foreign nation states. Terrorists use cyberspace to recruit, communicate and facilitate operations. Canada must deny them the means to operate in this domain. To this end, the Government continues to implement Canada's Cyber Security Strategy. Transportation systems are known terrorist targets. Even unsuccessful attacks can provide publicity sought by terrorists and inflict significant economic damage. As such, the security of aviation, marine, rail, road and intermodal transportation security systems have each been improved to protect them against terrorist attacks and prevent their use as a means to attack Canada or its allies. Terrorist groups have traditionally targeted global aviation security. The Passenger Protect Program (PPP), a shared responsibility between Public Safety Canada and Transport Canada, identifies individuals who may pose a threat to aviation security and reduces their ability to cause harm or threaten aviation by taking action, such as preventing them from boarding an aircraft. The Government remains committed to protecting the air traveling public and will continue to explore enhancements to the PPP. The Canadian Air Transport Security Authority (CATSA) also plays a role in ensuring air travel remains secure by providing passenger and baggage screening that is effective, efficient, and consistent. Security in other transportation modes such as rail and urban transit has also been enhanced in collaboration with industry and other federal and provincial government departments. Canada continues to work with international partners and organizations to establish appropriate aviation, surface and marine transportation security standards and best practices. As the threat is dynamic and terrorists continually seek ways to exploit vulnerabilities or circumvent existing transportation security measures, the Government is committed to ensuring that Canada's national transportation systems are secure, resilient and adaptable to mitigate emerging and potential threats. Physical security at government and public institutions, including training in terrorist identification and intervention, reduces the capacity of terrorists to strike these targets. The RCMP provides specialist physical security for Canadian dignitaries, such as the Prime Minister and the Governor-General, Internationally Protected Persons, designated sites such as Parliament Hill and major events such as the recent 2010 Olympic Games in British Columbia and the 2010 G8/G20 summits in Ontario. The Prime Minister's Advisory Council on National Security provides confidential advice to the Government through the National Security Advisor (NSA) to the Prime Minister on issues related to national security. The Advisory Council is supported by PCO and meets several times a year to provide expert advice on a wide range of topics, including intelligence, law and policy, human rights and civil liberties, emergency planning and management, public health emergencies, public safety, border security, cyber security, transportation security, critical infrastructure protection and international security. The Advisory Council's contributions are one important way in which the Government understands how better to deny terrorists the means and opportunity to attack Canada, Canadians and Canadian interests. Purpose: to respond proportionately, rapidly and in an organized manner to terrorist activities and to mitigate their effects. Building resilience involves strengthening Canada's ability to manage crises, so that should a terrorist attack occur, Canada can quickly return to the routines of ordinary life. This includes supporting Canadians in need, protecting Canadian interests and minimizing the impact of terrorist activity. Capabilities to address a range of terrorist incidents are in place. Rapid response and recovery capability of critical infrastructure is maintained. Continuity of government and basic social institutions is ensured. Government leadership through effective public messaging is demonstrated. Respond programs and activities provide the capability for immediate coordinated response that will mitigate the damage of an incident, as well as longer term recovery. The immediate response to an incident will often involve strong coordination of effort between federal departments and agencies and could also include provincial, territorial and municipal authorities, as well as private businesses, critical infrastructure owners and operators and the general public, depending on where the incident occurs and the extent of the impacts. INSETs or NSES will lead the post-incident criminal investigation to apprehend perpetrators, prevent further related terrorist attacks and support prosecutions in the criminal courts. Longer term recovery relies on the existence of resilient social institutions and partnerships between governments, businesses, individuals and NGOs to rebuild communities and bring those responsible to justice. In practice, the immediate response to terrorist incidents, as in other emergencies, will be led by local law enforcement and emergency management authorities. This will often involve the RCMP as the first police responder in those provinces and territories where it provides local police services. For a terrorist incident within Canada, or for incidents overseas with a domestic impact, the Government has adopted an all hazards approach to emergency management. This is articulated in the Federal Emergency Response Plan (FERP), managed by the Minister of Public Safety. The FERP is designed to integrate with other plans across all levels of government, the private sector and the community as a whole. Federal departments and agencies are responsible for developing emergency management plans for risks in their areas of accountability, consistent with guidance from Public Safety Canada. Other plans and protocols, which are annexed to the FERP, provide for responses to specific situations. Examples include the Marine Event Response Protocol and the Air Incident Protocol. The FERP outlines circumstances, such as the need for federal support to deal with an emergency, where an integrated Government of Canada response is required. It sets out departmental roles in an emergency, governance and coordination structures and practical arrangements for providing information to government decision makers. Particular terrorist incidents may involve specified responses from designated agencies. For example, in accordance with the National Defence Act or as an exercise of the Crown Prerogative, the CF can be called upon to support the Government of Canada's counter-terrorism efforts and respond directly to terrorist incidents in Canada. PHAC is responsible for surveillance for diseases and events resulting from the use of CBRNE agents and coordinating a public health response to a terrorist incident. Health Canada also provides monitoring services, hazard assessments, information and advisories and decontamination strategies for CBRNE events. PHAC also maintains the National Emergency Stockpile System, which contains medical countermeasures against CBRNE agents and disaster medical supplies for use in mass casualty events. For a terrorist or security related incident abroad, the Minister of Foreign Affairs, supported by DFAIT, leads Canada's response. The Canadian response to an incident will vary depending on the nature of the incident. It might include the provision of consular assistance to Canadians overseas; financial or physical aid; or deployments of experts from the federal national security community. Ad hoc working groups plan and prepare for the security aspects of major events, such as the 2010 Winter Olympics in British Columbia and the 2010 G8/G20 summits in Ontario. These usually involve the different levels of government affected by the event, and response arrangements are tailored to the particular event in question. In addition, Health Canada is mandated to provide services to support the overall security objectives for major international events, specifically in the areas of health and safety of federal government employees, surveillance and response to radiological nuclear threats, and support to first responders in the event of a CBRNE event or disease outbreak. DND/CF has also established centres, such as Canada Command, to provide greater coordination with other federal departments and agencies, as well as domestic and international partners, in responding to national security events. In addition, the Justice Emergency Team is a group of legal counsel from across government who provide coordinated legal advice and support to federal departments and agencies in emergency situations, including terrorism related incidents. Building resilience against terrorism requires a capacity for effective communications between the Government and Canadians in response to a terrorist event. The Government must clearly explain to the public how the incident is being managed in order to maintain public trust and confidence. Under FERP, Public Safety Canada coordinates emergency public communications activities for the Government of Canada, between federal departments and agencies, and with other partners, including provincial and territorial governments and NGOs. DFAIT is responsible for communicating with foreign states and organizations and is also the lead for public communications on behalf of the Government of Canada with respect to incidents abroad. Terrorism will remain a dominant feature of the national security landscape for the foreseeable future. As counter-terrorism involves many departments and agencies, implementing the Strategy will require an integrated approach across the Government of Canada. The Strategy will only succeed with effective partnerships. These include partnerships with the provinces and territories, law enforcement agencies, international organizations, other countries, the private sector, NGOs and the broader community. Therefore, a crucial element of the Government of Canada's implementation approach across all elements of the Strategy will be forging strong, effective and mutually supportive relationships in counter-terrorism, with activities and responsibilities shared where appropriate between those partners. Ministers, departments and agencies are committed to maintaining strong policy and program design capabilities. The Cabinet Committee on National Security, created in 2011, is mandated to provide broad strategic direction for security and foreign policy related to Canada's national interest, and to oversee Canada's national security response activities. At a ministerial level, individual ministers are accountable for policy and program design within their areas of responsibility. Three ministers with particularly crucial roles with respect to counter-terrorism are the Minister of Public Safety, the Minister of Foreign Affairs and the Minister of National Defence. The Minister of Public Safety is the lead minister for overall counter-terrorism planning, preparedness and response within the Government of Canada, and for national leadership and coordination on matters relevant to national security. The Minister of Foreign Affairs is the lead minister with respect to international cooperation on counter-terrorism and on responding to terrorist incidents abroad. The Minister of National Defence will also play a critical role in preparation for, and execution of, any deployment of CF in response to terrorist activity at home or abroad. In an area like counter-terrorism, which is part of the mandate of a range of departments and agencies with national security responsibilities, effective coordination of policy development is critical. The principal coordinating roles within the Government on counter-terrorism rest with the Deputy Minister of Public Safety and the Deputy Minister of Foreign Affairs. Public Safety Canada ensures government wide planning across all elements of the Strategy is coherent and properly targeted at addressing the threat. DFAIT ensures Canada's international counter-terrorism efforts and engagements with international partners are coordinated across government. The NSA provides integrated cross-government advice and recommendations to the Prime Minister on national security issues, including counter-terrorism. A table outlining a high-level approach to the Strategy's implementation is provided in Annex C.
Cabinet has ministerial oversight of the Strategy. Review, maintenance, coordination and further development of the Strategy is the responsibility of the Minister of Public Safety, in consultation with the Minister of Foreign Affairs. In addition, an annual public report will be prepared to inform Canadians of the evolving domestic and international threat environment. The CBSA provides integrated border services that support national security priorities and facilitate the free flow of people and goods, including food, plants and animals, across the border. The CBSA applies a “multiple border strategy.” This involves identifying, interdicting and screening known or suspected terrorists and terrorist threats as far from North America as possible. The Charities Directorate of the CRA acts as the Government of Canada's centre of expertise on the charities aspect of terrorist financing by preventing, detecting and responding to the exploitation of charitable resources to support terrorism. While the vast majority of Canadian registered charities comply with their legal obligations, some do not or are at risk of being abused by those that support terrorism. The Charities Directorate reviews all charitable applications, monitors charities already registered, exchanges information when appropriate with Canada's intelligence and law enforcement agencies and conducts compliance-related activities in support of the Income Tax Act and the Charities Registration (Security Information) Act. In doing so, the Directorate protects the integrity of the charitable registration system and contributes to a whole-of-government approach to combatting terrorist financing. CATSA is charged with protecting the public through the screening of air travelers and their baggage. CATSA's responsibilities fall into four major air security areas: Pre-Board Screening of passengers and their belongings; Hold Baggage Screening through the acquisition, deployment, operation and maintenance of explosives detection systems at airports; Non-Passenger Screening of those entering airport restricted areas; and Restricted Area Identity Cards. As Canada's security intelligence agency, CSIS' role is to investigate threats, analyze information and produce intelligence. It then reports to, and advises, the Government. Counter-terrorism is the top priority for CSIS. In addition, CSIS has a mandate to investigate and provide advice to government departments on individuals seeking access to sensitive Canadian information, assets, sites or events and in preventing non-Canadians who pose security concerns from entering or gaining status in Canada. CIC is responsible for managing migration in a way that contributes to Canada's economic, social and cultural development, while protecting the health, safety and security of Canadians. Under the Immigration and Refugee Protection Act, CIC works closely with CBSA and Public Safety Canada to ensure that admissibility policies and screening programs effectively manage the security, criminality and health risks associated with admitting foreign nationals to Canada. CIC is also responsible for ensuring that newcomers and citizens participate to their full potential in fostering an integrated society. One of the key objectives of CIC's Multiculturalism Program is to build an integrated, socially cohesive society. Under the National Defence Act, CSEC is mandated to collect signals intelligence in accordance with the Government of Canada intelligence priorities. CSEC also provides advice, guidance and services to help ensure the protection of the government's electronic information and infrastructures. CSEC is also mandated to provide technical and operational assistance to federal law enforcement and security intelligence agencies regarding criminal and national security threats to Canada. CSC's primary mandate is to ensure the safety of the public, staff and offenders while respecting the rule of law. CSC is legally mandated to actively encourage and assist all offenders, including those convicted of terrorist offences, to become law-abiding citizens, while exercising reasonable, safe, secure and humane control. CSC works closely with its criminal justice, law enforcement, and intelligence partners to respond to any and all threats to Canada's national security. This is accomplished through the detection and sharing of information on the links that exist between federal offenders and individuals who may be associated with terrorist organizations or those who present a risk for radicalizing other individuals with violent or extremist ideologies. CSC ensures that individuals who are convicted of terrorist offences or are associated with extremist groups are managed appropriately to ensure that their potential risk to public safety and national security can be assessed and mitigated most effectively. The Department of Finance is responsible for and coordinates activities under Canada's anti-terrorist financing regime, which involves ten federal departments and agencies, provincial governments, the private sector and non-governmental bodies to combat terrorist financing. The Department also develops anti-terrorist financing policy, including with respect to the Proceeds of Crime (Money Laundering) and Terrorist Financing Act (PCMLTFA) and its regulations. It also leads Canada in a number of international activities, in particular, regarding the work of the Financial Action Task Force (FATF), the international standard-setting body with respect to terrorist financing. DFAIT is responsible for the conduct of Canada's affairs abroad, including leading Canada's responses to terrorist incidents abroad and providing consular support. It uses its broad international network to enable counter-terrorism co-operation with other states and its role within multilateral organizations to ensure that Canadian interests and values are reflected internationally, and to enhance the security of Canadians and Canadian interests. Within Canada, it ensures that domestic policy is informed by the international context and respects international obligations. The Department of Justice supports the dual roles of the Minister of Justice and Attorney General of Canada both in terms of the ongoing operations of government as well as the development of new policies, programs and services for Canadians to support the Government's priorities. The Department also provides legal advice to the Government and all federal government departments and agencies, represents the Crown in civil litigation and before administrative tribunals, drafts legislation, and responds to the other legal needs of federal departments and agencies. DND/CF have broad based involvement in the Government's counter-terrorism efforts and can work either as the lead or a supporting department. The breadth of DND/CF activities span both international areas of operation through various international engagements, and domestically, including support to law enforcement. DND/CF counter-terrorism operations are intelligence-led and are thus supported by robust and unique capabilities in terms of intelligence collection and analysis, surveillance, reconnaissance and communications. FINTRAC facilitates the detection, prevention and deterrence of money laundering, terrorist activity financing and other threats to the security of Canada by: gathering and analyzing information on suspect financial activities; ensuring those subject to the PCMLTFA comply with reporting, record keeping and other obligations; making case disclosures of financial intelligence to the appropriate agencies in support of investigations and prosecutions; producing strategic financial intelligence that identify trends, patterns and typologies of terrorist financing for use by the Canadian security intelligence community, law enforcement, as well as international partners and allies; and enhancing public awareness and understanding of matters related to money laundering. Housed at Public Safety Canada, the GOC is a Government of Canada asset which, on behalf of the Government of Canada, supports response coordination across government and for other key national players in response to emerging or occurring events affecting the national interest. The GOC is the principal means by which the Minister of Public Safety exercises his leadership role in emergency response under the Emergency Management Act. Health Canada is responsible for: providing scientific advice and laboratory support for human exposure to hazardous environments (chemical, biological, radiological and nuclear); the development of human health based Drinking Water Guidance Values in the event of contamination of a drinking water supply due to a spill, leak or intentional contamination of a drinking water supply; providing advice on treatment and monitoring and other mitigation actions; providing emergency preparedness and response support in dealing with emergencies that have an impact or potential impact on federal government employees or workplaces and First Nations communities. ITAC's primary objective is to produce integrated, comprehensive and timely assessments of the terrorist threat to Canadian interests, both domestically and internationally. ITAC's threat assessments are distributed to federal decision makers, the security intelligence community, law enforcement and other first responders, partners within the Government of Canada, and critical infrastructure stakeholders in the private sector. The PCO's Security and Intelligence Secretariat provides policy support to the National Security Advisor (NSA) to the Prime Minister, the Prime Minister and the Clerk of the Privy Council, and coordinates committees on security and intelligence issues. The NSA to the Prime Minister provides information, advice and recommendations on security and intelligence to the Prime Minister; co-ordinates the security and intelligence community; and oversees intelligence assessment. international collaboration with public health partners on issues related to health security. The PPSC is a functionally independent organization responsible for prosecuting cases under federal jurisdiction and, with provincial authorities, also has the jurisdiction to prosecute terrorism. It provides pre-charge advice and assistance to police investigators, such as the Royal Canadian Mounted Police, and prosecutes the charges that are laid. Public Safety Canada plays a lead role in thecoordination, development and implementation of national security policies, working primarily with three key Public Safety Portfolio agencies: the CBSA, CSIS and the Royal Canadian Mounted Police. Public Safety Canada was established to provide coordination across key federal departments and agencies responsible for national security and public safety. The Minister of Public Safety is responsible for exercising leadership relating to public safety and emergency preparedness. The Minister coordinates the activities of the Public Safety Portfolio agencies and establishes their strategic priorities relating to public safety and emergency preparedness. Public Safety Canada also works closely with the PCO to advance security and intelligence initiatives for Cabinet consideration. The RCMP has primary responsibility for national security law enforcement across Canada to reduce risk of terrorism at, within and beyond Canada's borders. This mission is principally implemented through the investigative activities of the RCMP-led Integrated National Security Enforcement Teams (INSETs) based in Vancouver, Toronto, Ottawa and Montreal, the RCMP-only National Security Enforcement Sections (NSES) in every other province and the Border Integrity Program. The RCMP also works with private sector critical infrastructure partners to proactively address terrorist threats to critical infrastructure and with local communities and foreign partners to counter violent extremism and radicalization leading to violence. As Canada's national police force, the RCMP also acts as a “first responder” in hundreds of municipalities and communities in the eight provinces and three territories where it provides policing services, and engages in protective policing for high profile individuals, sites, events and locations. Internationally, the RCMP also provides Canadian police personnel as well as expert police advice in support of capacity building and stabilization efforts to international peace operations in failed or fragile states; delivers capacity building assistance in the form of expert placements, mentoring programs, training and equipment; and links Canada to the INTERPOL network to facilitate its involvement in global police cooperation and joint operations. Transport Canada is responsible for national transportation policies and programs and pursues a risk-management approach to ensure their efficiency and effectiveness. Transport Canada is committed to enhancing the security of transportation systems by continually responding to identified security needs. This reinforces the goal to protect Canadians and the transportation system by developing security measures designed to mitigate vulnerabilities and potential threats, while ensuring the efficient movement of people and goods and protecting the rights and privacy of Canadians. The Parliament of Canada is authorized to make laws for the peace, order, and good government of Canada, which encompasses matters involving national security, under section 91 of the Constitution Act. Under the Canadian constitutional system, the executive branch can only undertake those activities that are authorized by law. Federal legislation further elaborates the Government of Canada's role in national security, including counter-terrorism. However, provincial, territorial and municipal authorities typically are the first line of response and have the closest links to communities. Constitutional and legal responsibilities cross jurisdictions. As various aspects of society can be affected by terrorism, federal authorities work with other levels of government that have primary responsibility for police, fire and paramedic services, public health, and general emergency response. The legal framework put in place by the Government of Canada to deal with terrorism reflects the conviction that the protection of its citizens is the first obligation of government. Although provincial and territorial governments are responsible for general law enforcement and criminal prosecutions, under the Security Offences Act (SOA), the Royal Canadian Mounted Police has primary responsibility for the investigation of offences involving national security. The Attorney General of Canada may exercise exclusive authority over the prosecution of these types of offences. The Department of Public Safety and Emergency Preparedness Act and the Emergency Management Act establish the responsibilities of the Minister of Public Safety for exercising leadership relating to public safety and emergency preparedness and management. The Department of Foreign Affairs and International Trade Act lays out the responsibilities of the Minister of Foreign Affairs for all matters relating to the conduct of Canada's external affairs, including countering international terrorism and responding to terrorist incidents abroad. Under the Canadian Security Intelligence Service (CSIS) Act, CSIS is mandated to collect and report information pertaining primarily to threats to the security of Canada, such as terrorism. It also outlines CSIS' roles and responsibilities, confers specific powers and imposes constraints, and sets the framework for CSIS' democratic control and accountability. Some of the legal responsibilities of other federal organizations involved in counter-terrorism are established in other departmental legislation, such as the National Defence Act and the Canada Border Services Agency (CBSA) Act. Others are determined by Cabinet pursuant to the common law. Under the National Defence Act, the Communications Security Establishment Canada is mandated to collect the communications of foreign targets as they relate to the capabilities, intentions or activities of terrorist groups. Other counter-terrorism responsibilities are determined by Cabinet pursuant to the Crown's prerogative powers with respect to actions taken in the defence of Canada and the conduct of its foreign affairs. Transport Canada's responsibilities are found in a number of key federal statutes, such as the Aeronautics Act, the Marine Transportation Security Act, the Railway Safety Act, the International Bridges and Tunnels Act and the Transportation of Dangerous Goods Act. The activities conducted pursuant to these federal statutes assist in securing the national transportation system from terrorist activities. Transport Canada is also responsible for the Canadian Air Transport Security Authority and is the lead department for responding to transportation security incidents and for transportation related emergency preparedness. The roles of the Department of Justice, the Attorney General of Canada and the Public Prosecution Service of Canada in counter-terrorism are defined by the Department of Justice Act, the Director of Public Prosecutions Act and the SOA, among others. These roles include legal advice, policy development and analysis, and the prosecution of criminal cases. The Income Tax Act provides the Charities Directorate of the CRA with the authority to deny or revoke registered charity status for organizations that do not comply with the provisions of the Act. Some examples of non-compliance with the Act that have been observed among charities and applicants that provide support to terrorist entities include using resources for non-charitable purposes, failing to carry on charitable activities, or failing to keep adequate books and records. In addition, the Minister of Finance is responsible for the Proceeds of Crime (Money Laundering) and Terrorist Financing Act (PCMLTFA), which provides key tools to detect, deter and prevent money laundering and terrorist financing. Before September 11, 2001, the Criminal Code had been amended periodically as required to implement United Nations (UN) counter-terrorism instruments that had been adopted since 1970. Terrorism was addressed using the normal processes of investigation, prosecution and conviction under the Criminal Code. ensured that Canadian values of respect and fairness were preserved and that hatred was addressed through stronger laws against hate crimes and hate propaganda. The measures contained in the ATA enhanced the Government of Canada's abilities to effectively deter, disable, identify, prosecute, convict and punish terrorists, thereby protecting Canadians from terrorist acts before they occur. The ATA created Part II.1 of the Criminal Code to deal specifically with terrorism offences. It sets out various terrorism offences and their punishments as well as a process for listing an entity as a terrorist group, with the effect of freezing the property of that group. A core provision is the definition of "terrorist activity" found in subsection 83.01(1) of the Criminal Code. The definition, which has two components, applies to activities inside or outside Canada. Satisfying either component constitutes a "terrorist activity." The first component of the definition is defined in part as an act or omission committed in or outside Canada that would be an offence under the major international instruments that apply to terrorist activities, like hijacking and terrorist bombing. The second part sets out a general definition of "terrorist activity." Under this general definition, "terrorist activity" is defined, in part, as an act or omission undertaken, inside or outside Canada, for a political, religious or ideological purpose that is intended to intimidate the public with respect to its security, including its economic security, or to compel a person, government or organization (whether inside or outside Canada) from doing or refraining from doing any act, and that intentionally causes one of a number of specified forms of serious harm. Section 83.05 of the Criminal Code provides a process for listing an entity. For listed entities, the fact of being listed establishes them as terrorist groups. This is because the Criminal Code defines "terrorist group" as an entity that has as one of its purposes or activities the facilitating or carrying out of terrorist activity or as an entity set out in a list established by regulation. the removal or denial of the charitable status of organizations that engage in or support terrorism. knowingly harbouring or concealing any person who has carried out or is likely to carry out a terrorist activity for the purpose of enabling the person to facilitate or carry out any terrorist activity. The Criminal Code has offences relating to the financing of terrorism and provisions relating to the freezing, seizure, restraint and forfeiture of terrorist property. These allowed Canada to become a party to the International Convention for the Suppression of the Financing of Terrorism, and assisted Canada in complying with UN Security Council Resolution 1373 and in broadly complying with the Financial Action Task Force Special Recommendations on Terrorist Financing. The ATA amended the Proceeds of Crime (Money Laundering) Act (PCMLA) to expand the mandate of the Financial Transactions and Reports Analysis Centre of Canada (FINTRAC), Canada's financial intelligence unit, to include the detection and deterrence of terrorist financing. The ATA provided FINTRAC with the legislative framework to permit it to assist in combating and detecting terrorist financing. In addition, amendments provided law enforcement authorities and CSIS with the capacity to share information about suspected terrorist financing activities. To reflect these changes, the PCMLA was re-named as thePCMLTFA. The ATA also enacted the Charities Registration (Security Information) Act to suppress and prevent support for terrorism and to protect the integrity of the registration system for charities under the Income Tax Act. This legislation makes possible the use of classified information in determining whether organizations can register as charities under the Income Tax Act or whether, previously having been registered, they can retain this status. The ATA also made changes to sections 37 and 38 of the Canada Evidence Act to address the judicial balancing of interests when the disclosure of information in proceedings would encroach on a specified public interest and, in particular, would be injurious to international relations, national defence or national security. Section 38 sets out a mini-code of procedure, establishing pre-trial, trial and appellate procedures to assist all parties and persons involved in proceedings in which there is a possibility that information injurious to international relations or national defence or national security would be disclosed. The ATA replaced the Official Secrets Act with the Security of Information Act (SOIA), which focuses on conduct harmful to, or likely to harm Canada. The concept of "harm to Canadian interests" was defined to address a wide array of potential harms, including terrorist activity, interference with critical infrastructure, and the development of weapons of mass destruction in contravention of international law. communicating or confirming special operational information by a person permanently bound to secrecy. As well, the SOIA includes an offence of foreign influenced and terrorist influenced threats or violence. It was intended to deter the manipulation and control of ethno-cultural communities in Canada, in direct violation of Canadian sovereignty, in ways that harm, or are likely to harm Canadian interests. Maintaining the safety of Canadians and denying access to Canadian territory to persons who pose national security threats are among the objectives set forth in the Immigration and Refugee Protection Act (IRPA). To meet these objectives, IRPA provides for the removal from Canada by the CBSA of non-citizens found inadmissible on grounds of security. While the vast majority of decisions on security inadmissibility are rendered by the Immigration and Refugee Protection Board, a security certificate may be used in exceptional cases that rely on classified information. Security certificates have historically been issued against individuals considered inadmissible on security grounds and the subjects have been detained or subject to stringent terms and conditions pending removal in order to mitigate any danger to the public or to national security. Amendments made in 2008 have added additional protection to ensure the fairness of any closed proceedings by providing, in such cases, for special advocates to protect the interests of the individuals named in the security certificate. The special advocates are provided with access to sensitive information being relied on to support the certificate. Prevent The Department of Foreign Affairs and International Trade (DFAIT) works with international partners to counter violent extremism and with a wide range of partners to prevent attacks on Canadian interests abroad. Security intelligence agencies collect and share intelligence with domestic and international partners on groups and individuals of concern to more effectively target government efforts aimed at preventing people from turning to violent extremism. Community outreach and liaison initiatives by policing authorities are critical in building partnerships, and identifying at-risk individuals and stopping them from turning to violent extremism. The Department of National Defence and the Canadian Forces (DND/CF) work with other government and non-government entities domestically and internationally to stabilize fragile states. This limits the conditions conducive to the development of violent extremist ideologies internationally. Detect DFAIT provides assessments that contribute to identifying terrorist threats to Canadian interests abroad and at home. DFAIT also contributes information that may assist partners to assess information sharing internationally. Intelligence efforts can detect the activities of individuals and organizations who may pose a terrorist threat, and then appropriately share that information in a timely fashion with domestic and international partners and other authorities. Working closely with security intelligence services, criminal investigations of terrorist activities allow for the identification of individuals involved in terrorism and their activities. Internationally, DND/CF work with Canadian security intelligence and law enforcement agencies to detect potential terrorists and share information with foreign and Canadian partners. Deny DFAIT leads and coordinates Canadian counter-terrorism capacity building to assist partner foreign states to address terrorist threats; advocates for and monitors states' implementation of their international counter-terrorism commitments; and facilitates the engagement with foreign states of Canadian partner agencies on terrorism issues. Intelligence efforts can increase knowledge about the risk to particular targets, including critical infrastructure and individuals, enabling more tailored and proportionate protection mechanisms. Law enforcement actions, including supporting prosecutions, deny terrorists the means and opportunity to carry out terrorist attacks. Police also play a vital role in the protection of people, critical infrastructure and borders. DND/CF own or protect significant military assets and Canadian critical infrastructure both at home and abroad. By protecting these assets, they deny terrorists the means and opportunity to attack Canadian interests. Respond DFAIT in consultation with the National Security Advisor to the Prime Minister leads the Government's integrated response to terrorist incidents abroad, including relevant “lessons learned” exercises once the incident has occurred. During a response to a terrorist incident in Canada or abroad, intelligence reporting from domestic and international partners can provide continual updates of the threat situation faced by responders and support post-incident investigations. The immediate response to an incident is usually led by local policing authorities, working with other emergency responders. Police also play a critical role in post-incident investigations and the prosecution of those responsible for terrorist incidents. In the event of a significant terrorist incident in Canada or abroad, DND/CF may be involved with other emergency management organizations or allies to respond to the incident and assist in providing a rapid return to normalcy.